Onwuka was charged before Hon. Justice Mojushola Dada, by the Independent Corrupt Practices and Other Related Offences Commission (ICPC) on a one-count bordering on making false statement to a constituted authority. 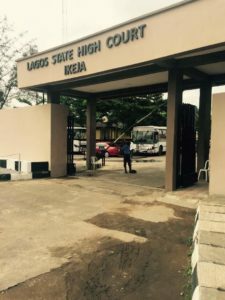 The court was told by ICPC that the offence committed by the police officer violated Section 25(1) (a) of the Corrupt Practices and Other Related Offences Act, 2000 and was punishable under the same section. The court also heard that the convict presented a false bank statement of account to the Consular and Visa Officer of the British High Commission in Nigeria, with the intent to mislead the High Commission into issuing her a travel visa to United Kingdom (UK). Counsel to the convict, Mr. C. Ubani, pleaded with the court to show mercy to her, saying she was a first-time offender and had cooperated fully with the prosecution. Justice Dada, in his ruling, sentenced her to three months imprisonment with an option of fine of N10, 000.